I’ll start off this post by saying I’m not trying to convince you that frozen food should replace fresh food all the time. I think most of us know that eating fresh is the best way to go. However just as many of us have had times when we didn’t have time to run to the grocery store, or didn’t have time to cook something up, and in those times, a frozen meal can be a “meal saver”, especially when you’re purchasing quality frozen meals like those from Healthy Choice and Marie Callendar’s. We’ve all heard about frozen foods – aka TV dinners – those glamorous plastic trays that you microwave, only to get a few piles of salty mush that can’t really be identified. However, I’ve found that to be more of a stereotype now. Maybe frozen meals were like that before, but now you can get a Healthy Choice frozen meal that actually looks like chicken, or beef, or fresh carrots. You get the idea. For example, I recently tried the Healthy Choice Beef Merlot Cafe Steamers. It was one of those days where I’d been running back and for from one store to another, on top of laundry, cleaning the house, and doing some coding. I was tired and I did not want to cook dinner. Fortunately, I had just picked up some Healthy Choice meals, so I grabbed one from the freezer, heated it up, and was able to enjoy the bold flavors of the Healthy Choice Beef Merlot Cafe Steamers. 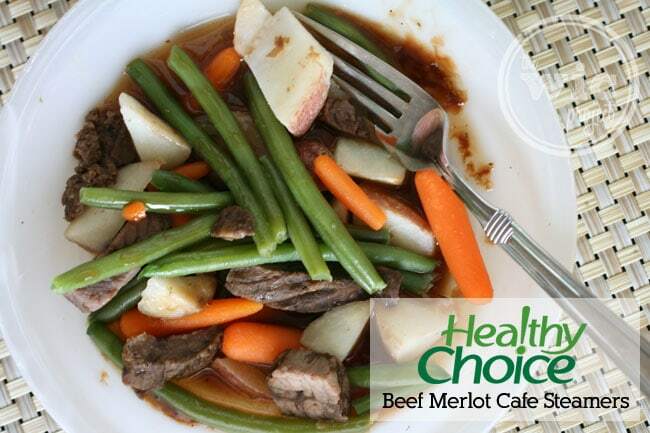 The Healthy Choice Beef Merlot Cafe Steamer was great for a quick dinner. Contrary to popular belief, frozen meals like Healthy Choice and Marie Callender’s meals are actually made with fresh ingredients, with most of the veggies going from farm to freezer within 24 hours. I’m continually impressed by the crispy veggies and tender meats in these meals. 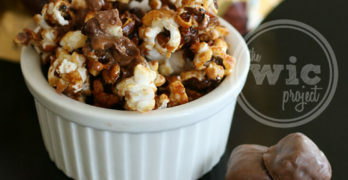 Seriously – the carrots actually have a crunch! We’ve been led to believe that most frozen meals are bland or lacking in flavor. While that may be true for some meals, there’s a reason I’ve been eating Healthy Choice for years (and years.) Their meals taste GOOD. Like, really, really good. Good enough for me to have favorites and good enough for me to want to try the other varieties. I could actually taste the wine flavor in the Beef Merlot. The sauce was totally flavorful and didn’t taste like they just threw salt in it to make it taste good. Think eating healthy means you can’t eat frozen meals? I’m not going to argue that some frozen meals aren’t healthy for you, but there are some meals from Healthy Choice and Marie Callender’s that are less than 400 calories and still taste great. Plus, when you have one meal, you’re using built in portion control which helps avoid the temptation of grabbing one more piece of chicken. For the past few weeks I’ve been saying that “I wish I had something I could just eat without having to actually cook!” With Healthy Choice frozen meals, now I have that option. I’ll definitely be picking up a few more meals to stock-up our freezer for those nights where I could use a cooking break. Disclaimer: This is a sponsored post written by me on behalf of ConAgra Foods. All opinions are my own. I am not a fan of frozen meals per se, but definitely frozen foods – particularly organic fruits and veggies. Frozen food is potentially much fressher than fresh, as it has been frozen close to picking which maintains its nutrition. Also, forzen means that we don’t have to eat out-of-season produce which is bad for the environment in so many ways. And yes, I do occasionally eat a frozen meal like you do! I love using frozen foods. The veggies are so much better than canned–just as good in cooking as fresh for most dishes. And the frozen dishes are not your grandma’s TV Dinner! I always use frozen vegetables, so much easier! My step-dad is diabetic and it is hard to cook foods that he really likes and keep his sugar count down. We found a few frozen food dinners that he can take for lunches that he loves. For our house, we find frozen meals that are easy to cook and healthy for our family. I can’t say I’ve tried these kinds of meals before, because I try to stay away from anything processed. Because of your review, I will have to give them a try, because I would love to have the option of something quick to eat that is healthy and actually tastes good. I’ve tried those. They aren’t bad as far as frozen meals go. I buy frozen dinners and love the ones I get. They are great when you are to busy to cook.